Can't Believe it? The Wall is the panel! 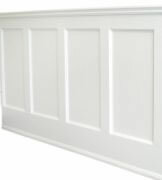 The Classic look of Wall Paneled Wainscot is our standard kit. This look of elegance is achieved by use of your drywall for the inside panels. The vertical stiles can be adjusted at any position for your individual liking giving the balance you require. All of the components have been specially routered to fit together. The stiles simply connect into the lower and upper rails with fine precision. No need to worry about wall or telephone plugs. Come in complete and easy to install kit which provides for up to 8 running feet of material. 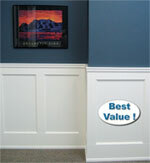 The wall panel kits are available in either a 36” or 42” overall height. The stiles are adjustable to accommodate the dimensions of any room, enabling even spacing along any given wall. Fast, affordable, and best of all - a gorgeous, professional finish! To order your kit(s), you will need to calculate the perimeter wall measurements of your room. This will determine the number of kits required. Remember, all kits come complete 8 feet in length. When measuring, you should always allow for at least ten percent for waste material. Also consider your ceiling height when choosing your kit height. The higher the ceiling the longer the stiles should be. The total height of the system will be 36” when using the shorter 23” stiles, and 42” in total height with our 29” stiles. We recommend that you examine your installation site for height suitability prior to ordering. Our wainscot kits are preprimed, ready for assembly and final coat painting. Offered at an unbeatable price of $10.00 per linear foot, a typical room can be fully finished, with a professional look for a comparatively low price. 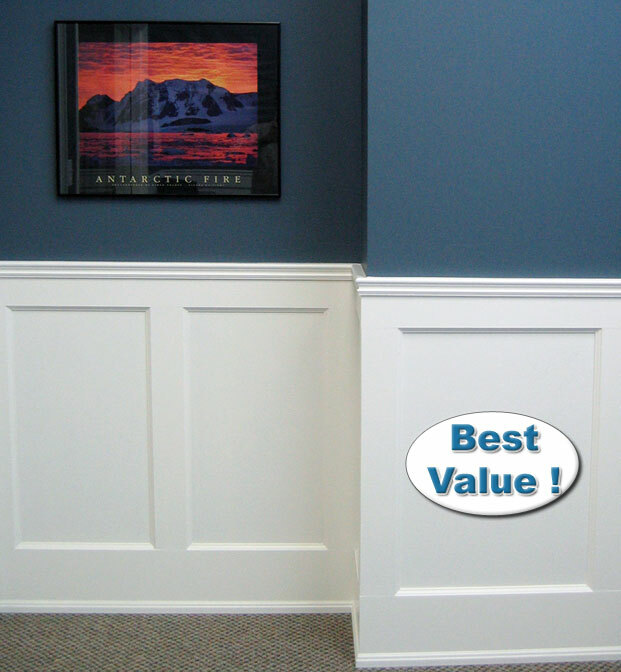 We think our product provide the best and affordable wainscoting system anywhere on the internet. We ship anywhere in Canada, and the Continental USA. Our products are packaged with extreme care to prevent damage during shipping. Quickly expedited to provide our customer with efficient service. Keep in mind you are not on your own once you receive your kit(s). This website includes detailed installation advice when needed, or if there are any questions or concerns before or after your purchase, do not hesitate to call at 1-800-383-4333. We stand for quality service and have an unsurpassed reputation. We are in the business of satisfying you the consumer. * We do not share or sell your personal information. Your personal information and or email address is used strictly for replying to your questions and comments, as well as informing you of any additional information.